Samuel Smale "Sam" Bragg was born July 8, 1848, in Clarke Twp., Durham Co., Canada West, and died July 19, 1925, in Lot 3 Concession 3, Providence, Darlington Twp., Durham Co., Ontario, Canada, at age 77. Buried in Bowmanville Cemetery, Bowmanville, Durham Regional Municipality, Ontario, Canada. He is the son of Thomas Smale Bragg of Pyworthy, County Devon, England, and Ann Allin of Burrow Farm, Sutcombe Parish, County Devon, England. Elizabeth Jane "Eliza" Dobson was born February 28, 1849, in Charlecote, near the Morrish church, east of Newtonville, Clarke Twp., Durham Co., Canada West, and died April 9, 1879, in Clarke Twp., Durham Co., Ontario, Canada, at age 30. She is the daughter of George Dobson of Yorkshire, England, and Elizabeth (Unknown) of England. Samuel Smale "Sam" Bragg and Elizabeth Jane "Eliza" Dobson were married June 24, 1873, in Clarke Twp., Northumberland and Durham Co., Ontario, Canada. Wesley Dobson Bragg: Born November 4, 1873, in Clarke Twp., Durham Co., Ontario, Canada; Died July 12, 1930, in Durham Co., Ontario, Canada (age 56). Buried in Bowmanville Cemetery, Bowmanville, Durham Regional Municipality, Ontario, Canada. 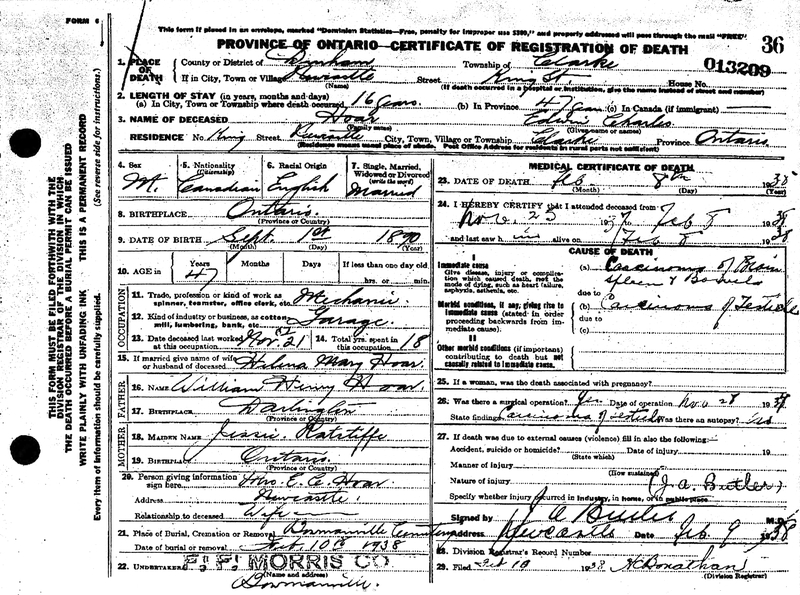 Married September 15, 1898, in Clarke Twp., Northumberland and Durham Cos., Ontario, Canada, to Amelia "Millie" Osborne: Born August 25, 1867, in Clarke Twp., Ontario, Canada; Died March 25, 1924, in Lot 5, Concession 1, Darlington Division, Durham Co., Ontario, Canada (age 56). Buried in Bowmanville Cemetery, Bowmanville, Durham Regional Municipality, Ontario, Canada. Martha Ann Bragg: Born May 31, 1876, in Clarke Twp., Durham Co., Ontario, Canada; Died March, 1905, in Manitoba, Canada (age 28). Buried in Arden Cemetery, north of Arden, Lansdowne RM, Manitoba, Canada. Married August 12, 1901, in Darlington, Ontario, Canada, to Joseph William Gordon: Born December 4, 1868, in Hastings Co., Ontario, Canada; Died June 13, 1954, in Winnipeg, Manitoba, Canada (age 85). Buried in Chapel Lawn Memorial Gardens, Also known as: Assiniboine Memorial Park Cemetery, Winnipeg, Greater Winnipeg, Manitoba, Canada. Joseph then married Martha's sister, Elizabeth Blackburn Bragg: Born March 27, 1879, in Clarke Twp., Durham Co., Ontario, Canada; Died January 10, 1969, in Unknown (age 89). Elizabeth Blackburn "Bernie" Bragg: Born March 27, 1879, in Clarke Twp., Durham Co., Ontario, Canada; Died January 10, 1969, in Manitoba, Canada (age 89). 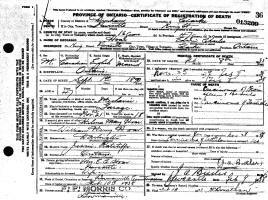 Married about 1907 in Canada to Joseph William Gordon: Born December 4, 1868, in Tweed, Hastings Co., Ontario, Canada; Died June 13, 1954, at his home, 288 Niagara Street, Winnipeg, Manitoba, Canada Unknown (age 85). Elizabeth Jane "Eliza" (Dobson) Bragg died April 9, 1879, in Clarke Twp., Durham Co., Ontario, Canada, at age 30. Samuel Smale "Sam" Bragg then married Ellen Jane Abbey. Ellen Jane Abbey was born September 3, 1852, in Hope Twp., Durham Co., Canada West, and died October 31, 1943, at Oshawa General Hospital, Oshawa, Durham Co., Ontario, Canada, at age 91. Buried in Bowmanville Cemetery, Bowmanville, Durham Regional Municipality, Ontario, Canada. 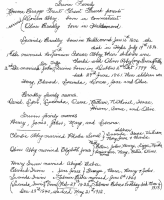 She is the daughter of Oliver Nathaniel Abbey of Hope Twp., Durham Co., Upper Canada, and Elizabeth Jones of Clarke Twp., Durham Co., Upper Canada. 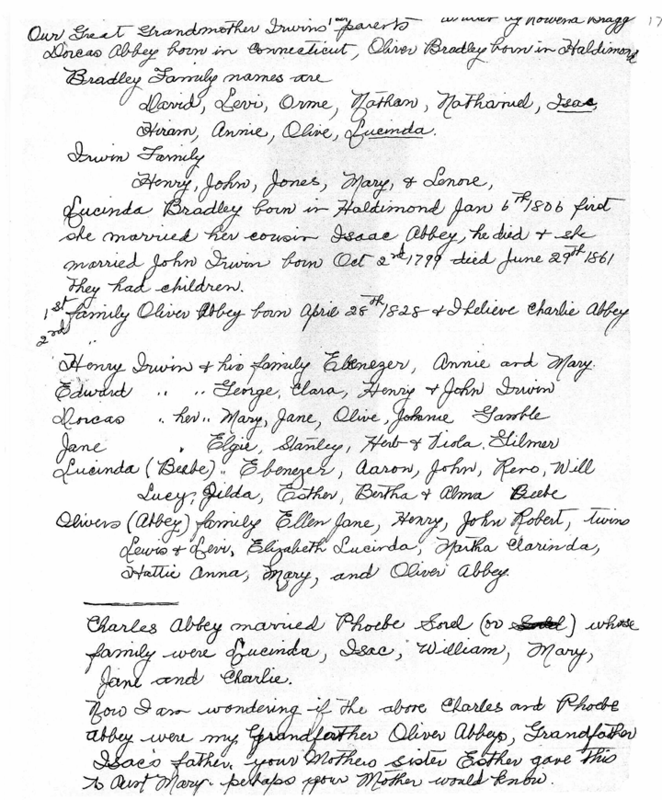 Samuel Smale "Sam" Bragg and Ellen Jane Abbey were married March 9, 1887, in Hamilton Twp., Durham Co., Ontario, Canada. Helena Mary "Lena" Bragg: Born August 10, 1890, in Darlington Twp., Durham Co., Newcastle District, Ontario, Canada; Died December 3, 1963, in Bowmanville, Durham Co., Ontario, Canada (age 73). Buried in Bowmanville Cemetery, Bowmanville, Durham Regional Municipality, Ontario, Canada. Married April 19, 1922, in Newcastle, Ontario, Canada, to Edwin Charles "E. C." Hoar: Born September 1, 1890, in Darlington Twp., Durham Co., Newcastle District, Ontario, Canada; Died February 8, 1938, in Newcastle, Ontario, Canada (age 47). Buried in Bowmanville Cemetery, Bowmanville, Durham Regional Municipality, Ontario, Canada. Rowena Jane Bragg: Born August 10, 1890, in Darlington Twp., Durham Co., Newcastle District, Ontario, Canada; Died about 1993 in Newcastle, Durham Co., Ontario, Canada (age 103). Never married. At age 99, she was a resident of Marnwood House Nursing Home, Bowmanville, Ontario, Canada. Arthur Charles Bragg: Born June 10, 1892, in Darlington Twp., Durham Co., Ontario, Canada; Died October 3, 1955, in Sannich, Enderby, British Columbia, Canada (age 63). 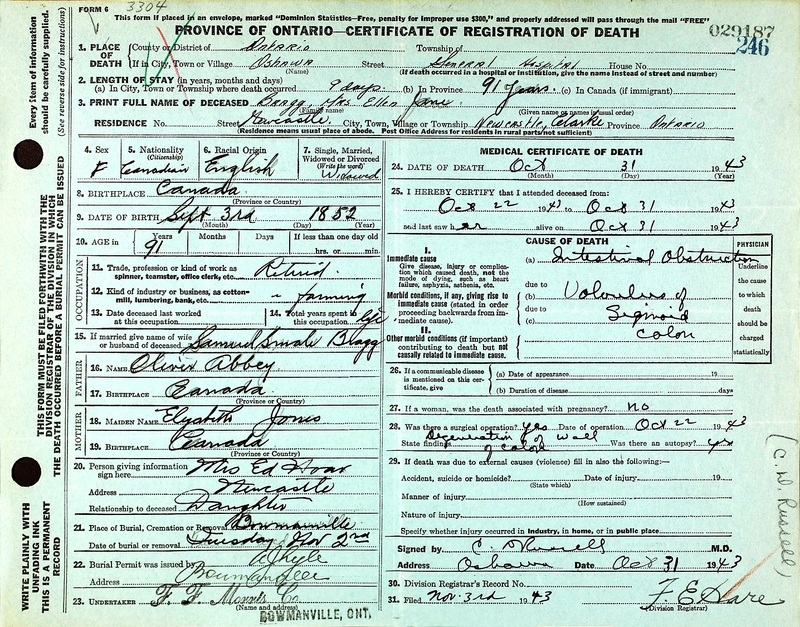 Married August 12, 1930, in Newtonville, Ontario, Canada, to Marion Henrietta Baskerville: Born September 5, 1907, in Lot 18, Concession 1, Clarke Twp., Durham Co., Ontario, Canada; Died January, 1987, in British Columbia, Canada (age 79). Samuel Smale "Sam" Bragg and Ellen Jane (Abbey) Bragg are buried in Bowmanville Cemetery, Bowmanville, Durham Regional Municipality, Ontario, Canada. Thanks to Find-A-Grave for making this image available. 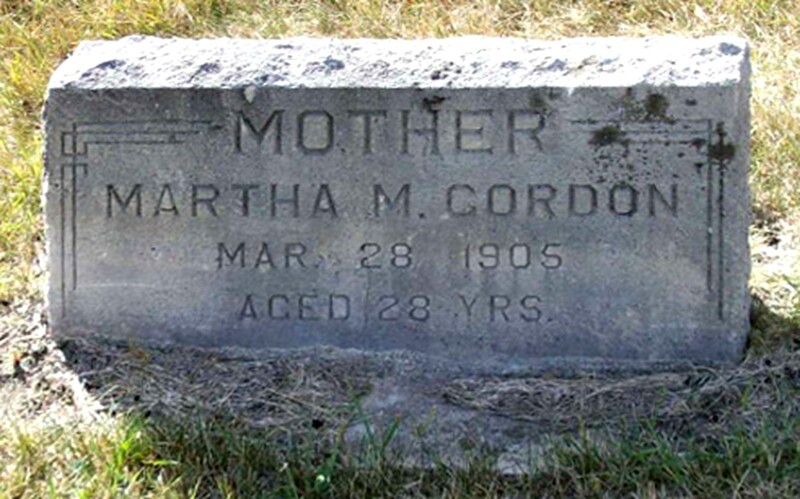 Martha Ann (Bragg) Gordon is buried in Arden Cemetery, north of Arden, Lansdowne RM, Manitoba, Canada. 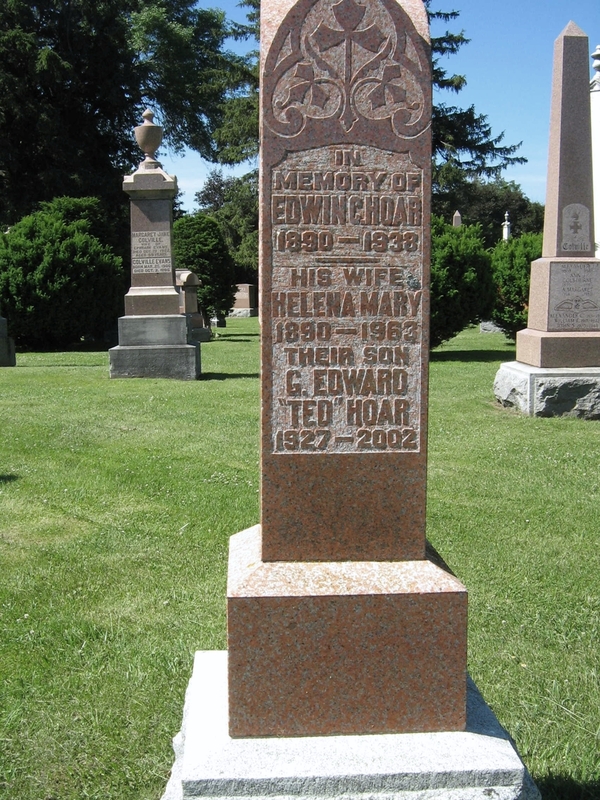 Edwin Charles "E. C." Hoar and Helena Mary "Lena" (Bragg) Hoar are buried in Bowmanville Cemetery, Bowmanville, Durham Regional Municipality, Ontario, Canada. 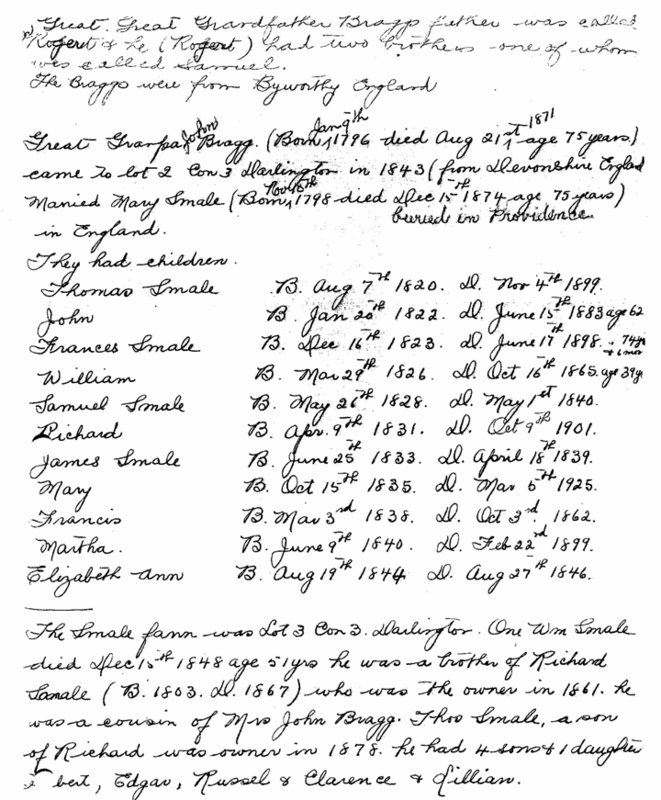 Samuel Smale "Sam" Bragg was born July 8, 1848, in Clarke Twp., Durham Co., Canada West. Elizabeth Jane "Eliza" Dobson was born about 1848 in Canada West. 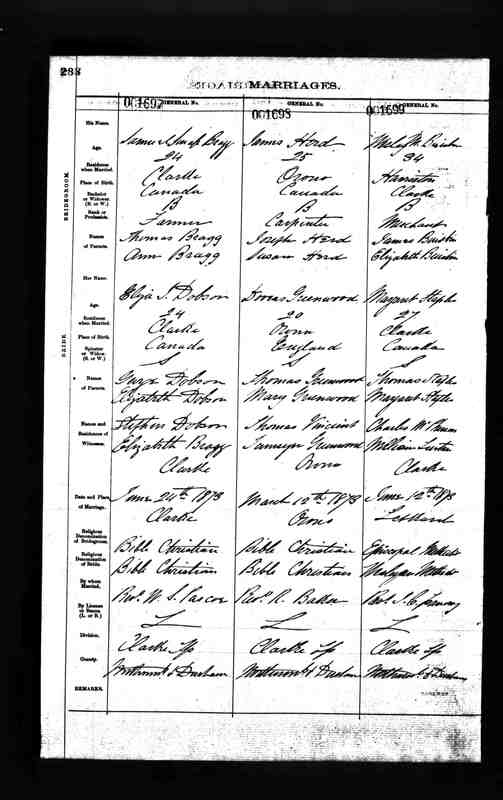 The 1851 Canadian Census taken on 1851 shows George Dobson (age 51) born in England is a Yeoman and is living in Clarke Twp., Durham Co., Canada West. 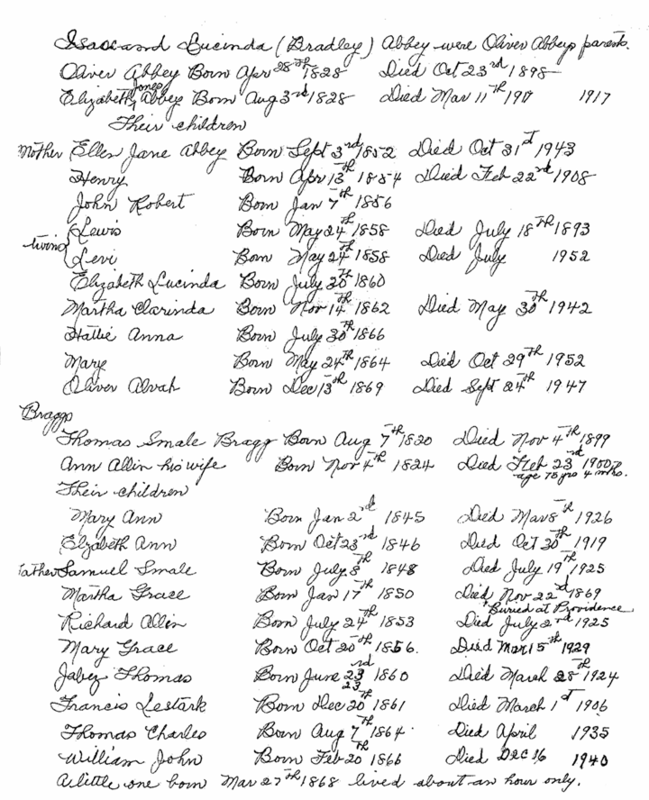 Living with him are: Mrs. E. Dobson (age 46) born in England; Rachel Dobson (age 22) born in England; Betsy Dobson (age 19) born in Canada; George Dobson (age 17) born in Canada; Robert Dobson (age 13) born in Canada; Mary Ann Dobson (age 11) born in Canada; William Dobson (age 8) born in Canada; John James Dobson (age 6) born in Canada; and Eliza Jane Dobson (age 3) born in Canada. 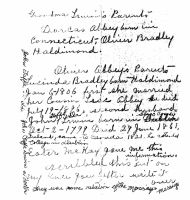 Helena Mary "Lena" Bragg and Ellen Jane Abbey were born September 3, 1852, in Clarke Twp. or Hope Twp., Durham Co., Canada West. 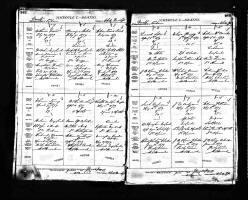 The 1861 Census shows Ellen Abby (age 9) is living in Nottawasaga Twp., Simcoe Co., Ontario, Canada. 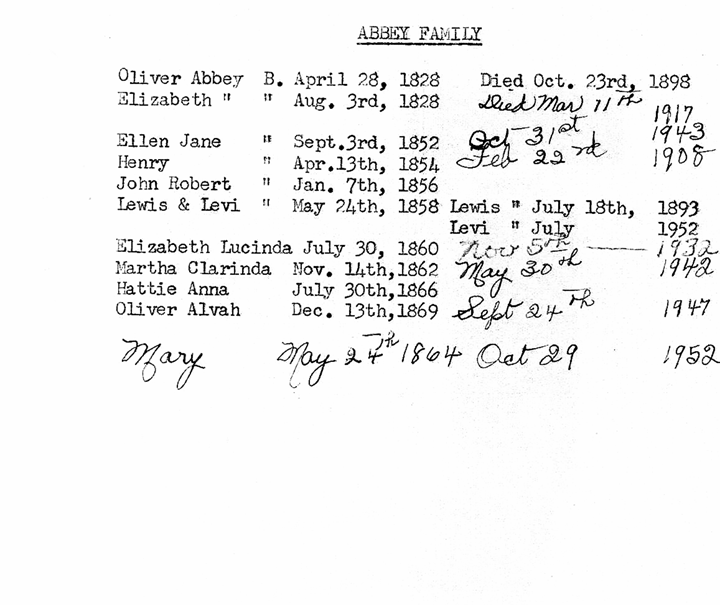 The 1871 Census for Hope Twp., Durham Co., Canada West, shows Alrien Abby (age 42) is a Farmer living in Hope Twp. 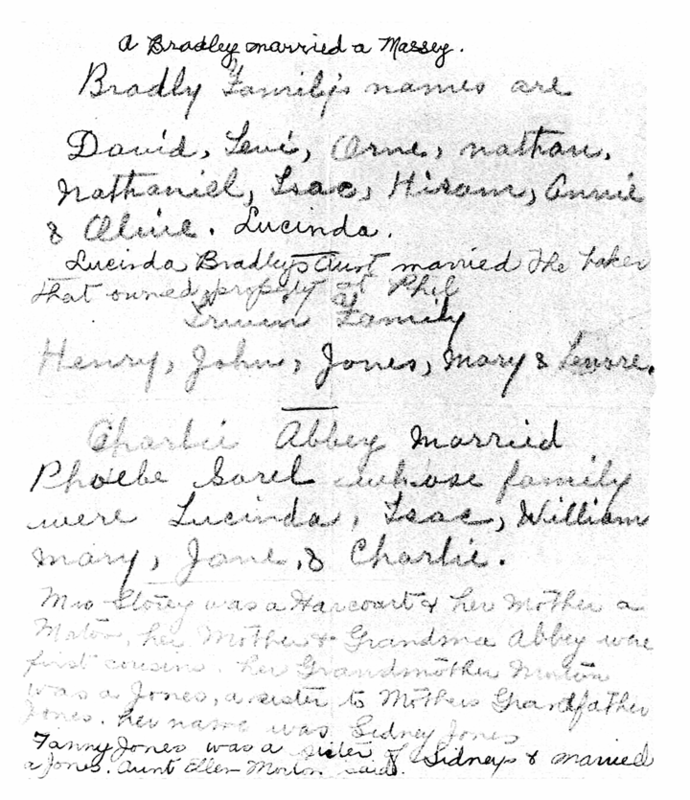 Living with him are his wife Elizabeth Abby (age 43), and children: Ellen Abby (age 18), Henry Abby (age 16), John R. Abby (age 14), Levi Abby (age 13); Eliza Abby (age 10); Martha Abby (age 9); Mary Abby (age 7); Hattie Ann Abby (age 3) and Oliver Abby (age 1). 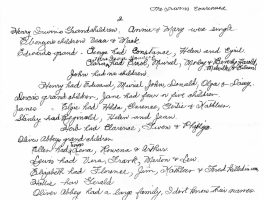 All family members were born in Upper Canada. 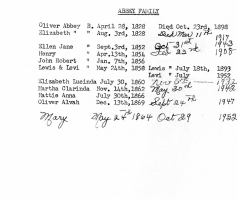 Elizabeth Jane "Eliza" (Dobson) Bragg Death Record. The 1881 Census shows Samuel Bragg (age 32) is a Farmer and is living in Hope Twp., Durham Co., Ontario, Canada. The 1881 Census shows Ellen Abbey (age 28) is living in Hope Twp., Durham Co., Ontario, Canada. 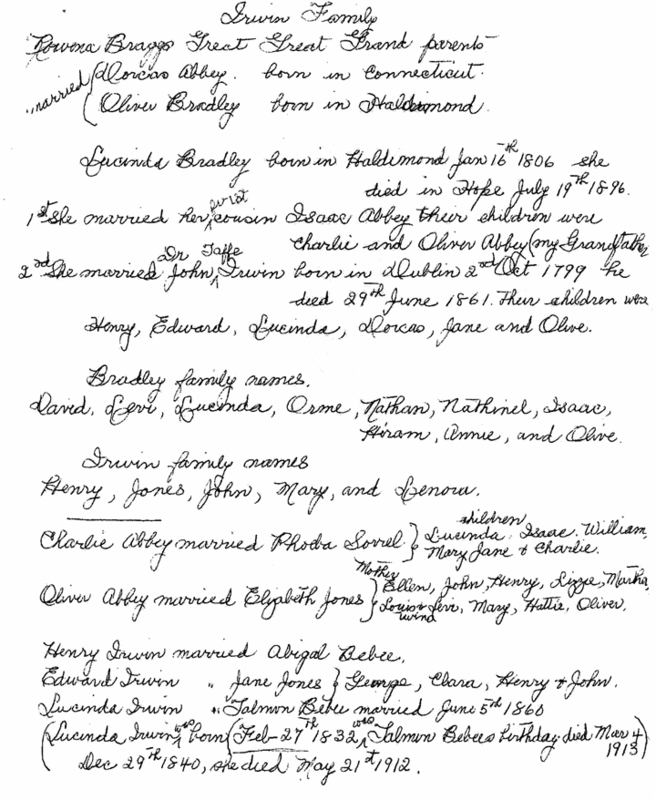 Samuel Smale "Sam" Bragg and Ellen Jane Abbey Marriage Record. Rowena Jane Bragg: Born August 10, 1890 in Darlington Twp., Durham Co., Newcastle District, Ontario, Canada. 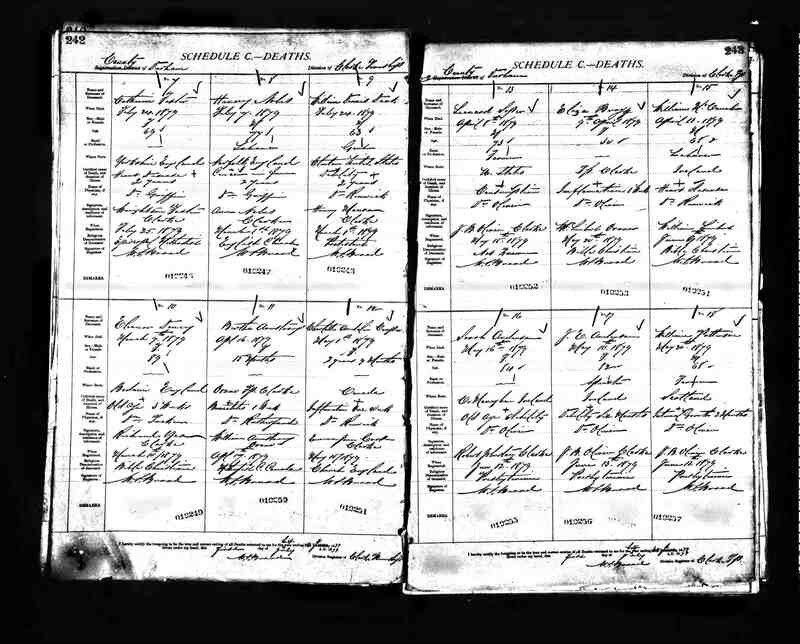 Helena Mary "Lena" Bragg and Rowena Jane Bragg (twins) Birth Record. 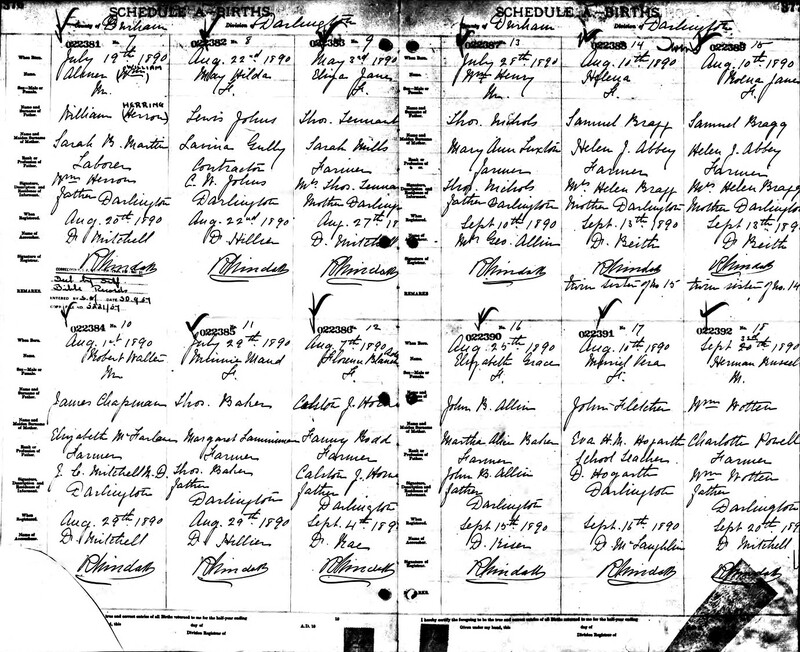 The 1891 Canadian Census taken on 1891 shows Samuel S. Bragg (age 42) born in Ontario is living in West Darlington Twp., Durham Co., Ontario, Canada. Living with him is his wife Ellen J. Bragg (age 40) born in Ontario. Also living there are his children, all born in Ontario: Wesley Bragg (age 17); Martha Bragg (age 14); Elizabeth Bragg (age 12); Helena Bragg (age 7/12); and Rowena Bragg (age 7/12). 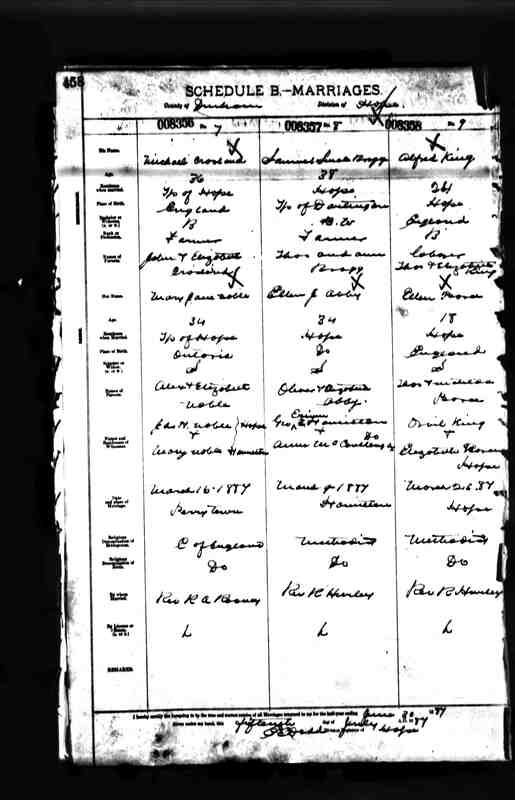 The 1901 Canadian Census taken on April 5, 1901, shows Samuel Bragg (age 51) born July 8, 1849, in Ontario is a Farmer of his Own Farm and is living in Darlington Twp., Durham West, Ontario, Canada. Living with him is his wife Ellen Bragg (age 48) born September 3, 1852, in Ontario. Also living there are his children, all born in Ontario: Elizabeth Bragg (age 22) born March 27, 1879; Helena M. Bragg (age 10) born August 10, 1890; Rowena Bragg (age 10) born August 10, 1890; and Arthur C. Bragg (age 8) born June 10, 1892. A domestic Farm Laborer also lives in the household. 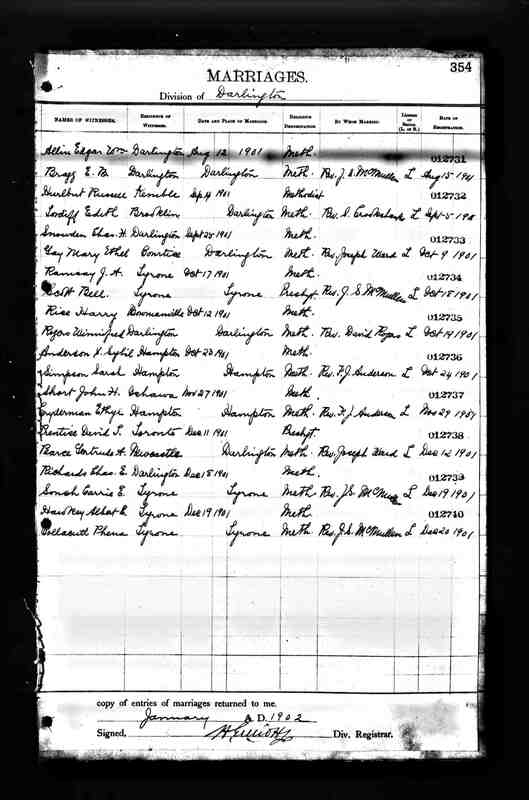 The 1911 Canadian Census taken on June 7, 1911, shows Samuel Bragg (age 62) born July 1848 in Ontario is living in Lot 4 Concession 3, Darlington Twp., Durham Co., Ontario, Canada. Living with him is his wife Ellen Jane Bragg (age 58) born September 1852 in Ontario. Also living there is their unmarried daughter, Rowena J. Bragg (age 20) born August 1890. Living next door is Samuel's son and daughter. 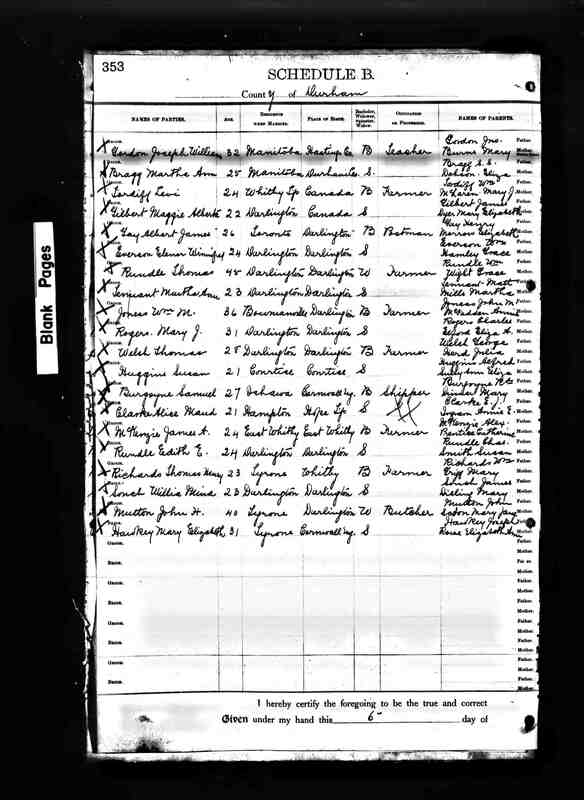 The 1911 Canadian Census taken on June 7, 1911, shows Arthur C. Bragg (age 18) born June 1892 in Ontario is unmarried and living in Lot 4 Concession 3, Darlington Twp., Durham Co., Ontario, Canada. Living with him is his unmarried sister, Helena M. Bragg (age 20) born August 1892 in Ontario. A boarder also lives in the household. 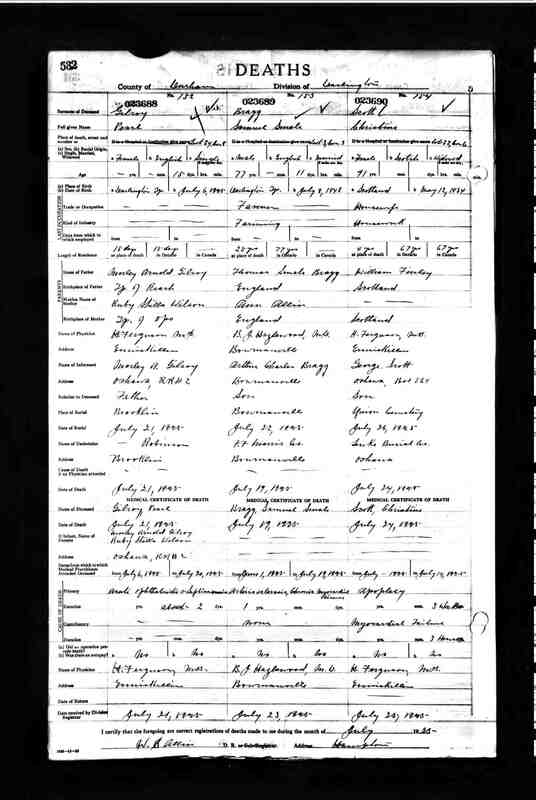 The 1911 Canadian Census taken on June 7, 1911, shows William J. Bragg (age 52) born July 1850 in Ontario is living a Farmer in Lot 2 Concession 3, Darlington Twp., Durham Co., Ontario, Canada. Wife Sarah and several children. 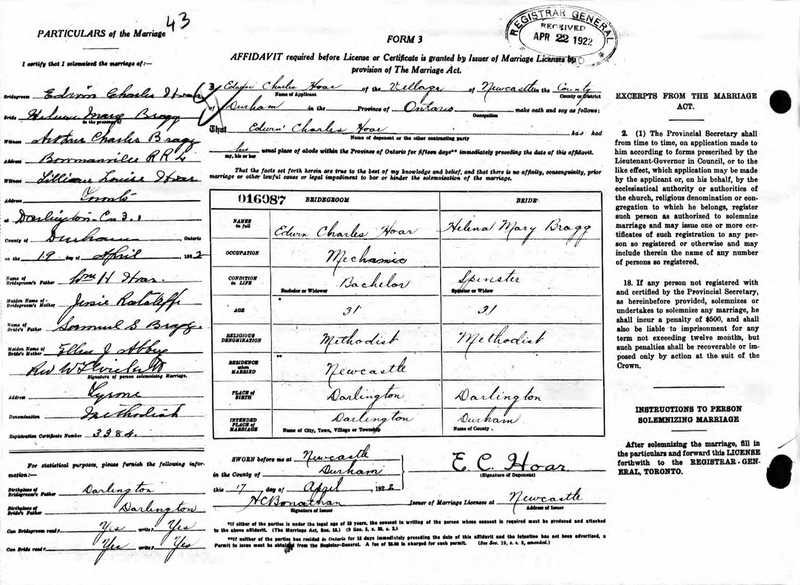 Edwin Charles "E. C." Hoar and Helena Mary "Lena" Bragg were married April 19, 1922, in Newcastle, Ontario, Canada. 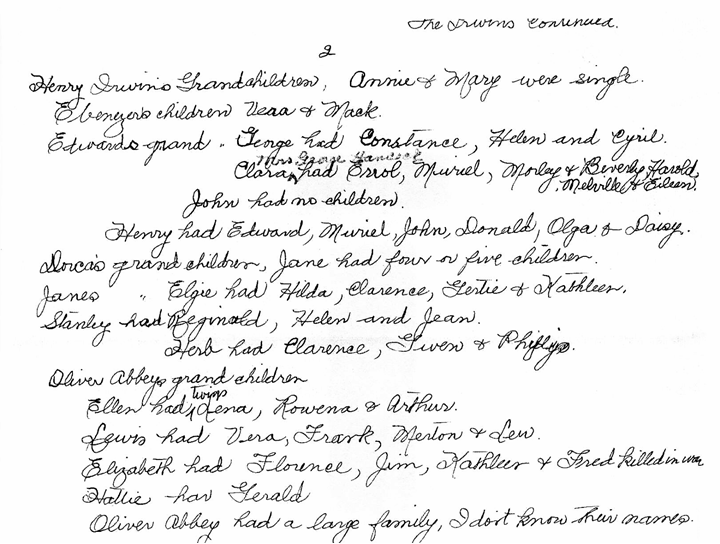 Edwin Charles "E. C." Hoar and Helena Mary "Lena" Bragg Marriage Record. 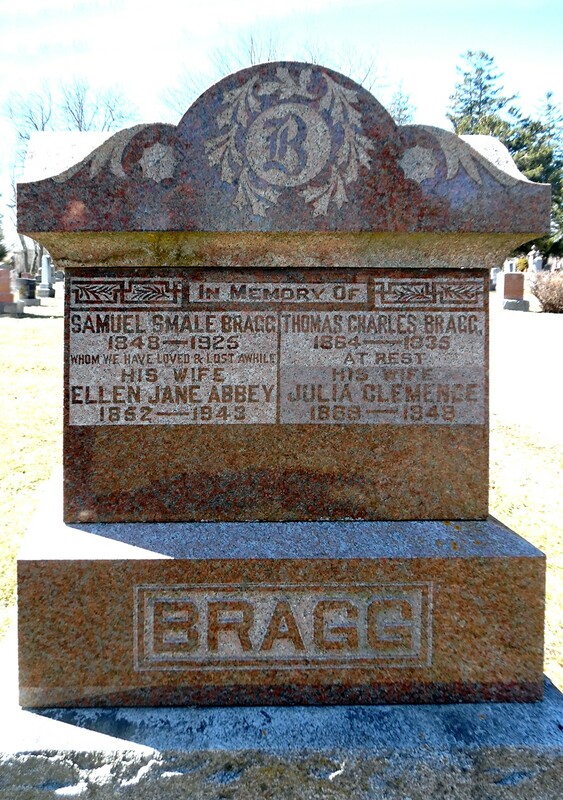 Samuel Smale Bragg died July 19, 1925, in Lot 3 Concession 3, Darlington Twp., Durham Co., Ontario, Canada, at age 77. Buried in Bowmanville Cemetery, Bowmanville, Durham Regional Municipality, Ontario, Canada. 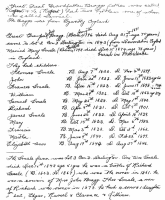 Samuel Smale Bragg Death Record. Just seventeen days ago after the call came to his brother, Mr. Richard Allin Bragg, Kingston Road, East, a similar call came to Mr. Samuel Smale Bragg, Providence, Darlington Township, early Sunday morning, July 19, when he passed away, aged 77 years. Deceased was born on July 8th., 1848, near Providence, being the eldest son of the late Thomas Smale Bragg and Ann Allin Bragg. He had been ailing for about five weeks from a slight heat stroke but was able to walk around for several days previous to his death which came rather suddenly at the last. Mr. Bragg was twice married - first on June 24, 1873, to Eliza Jane Dobson of Clarke, by whom he had one son and two daughters, Wesley D. Bragg, Kingston Road, East, Martha (deceased), and Elizabeth, Mrs. J. W. Gordon, Manitou, Man. They resided on the McConnachie farm north west of Orono for five years, then moved to the Grant farm 2-1/2 miles east of Newtonville for nine years. Mrs. Bragg died on April 9, 1879. 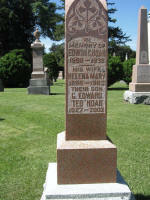 His second wife was Miss Ellen J. Abbey of Hope Township to whom he was married on March 9, 1887. They moved to Darlington to the farm where he died on March, 1888. By his second marriage were born one son and two daughters - Arthur and Miss Rowena at home and (Lena) Mrs. E. C. Hoar of Newcastle. His widow, two sons and three daughters survive. Also two brothers, Messrs. T. C. and W. S. Bragg, and two sisters, Mrs. W. H. Cobbledick and Mrs. W. H. Bar­rie. The funeral on Wednesday afternoon was largely attended, service being conducted by Rev. E. B. Cooke, Rev. J. U. Robins and Rev. J. W. Down. Deceased was a member and Treasurer of Providence Methodist Church for many years previous to its closing. The pall-bearers were all neigh­bors and old friends: Messrs. F. S. Blackburn, S. T. Dawson, C. J. Smale, H. T. Smale, M. H. Wight and R. K. Squair. The floral offerings were from the family and friends of Providence neighborhood. Among those present from a distance were: - Mr. Richard Allin and son Stanley, Whitby; Mrs. J. W. Gordon, Manitou, Man. 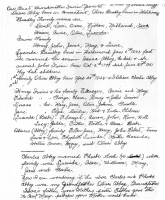 ; Mr. and Mrs. Will Hamilton, Mr. and Mrs. Gidduss Jones, Clarke; Mr. and Mrs. Herb. Gilmer, Starkville; Mrs. Chas. Armstrong, Toronto; Mrs. James Quantrill, Carievale, Sask. ; Mrs. F. L. Bragg, Oshawa; Mrs. Henry Jones, New York; Mrs. James MeHolme, Mr. Renno Bebee, Morrish..
Edwin Charles "E. C." Hoar died February 8, 1938, in Newcastle, Ontario, Canada, at age 47. Buried in Bowmanville Cemetery, Bowmanville, Durham Regional Municipality, Ontario, Canada. 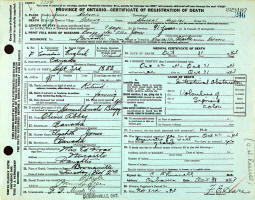 Edwin Charles "E. C." Hoar Death Record. 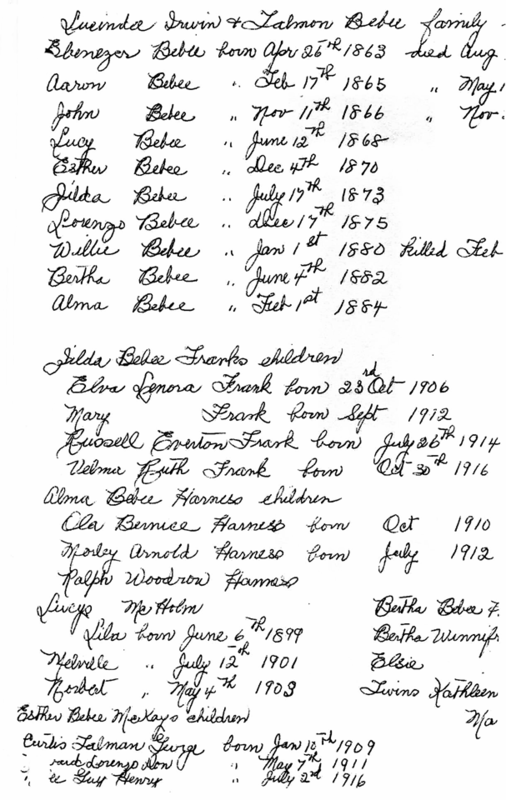 Ellen Jane (Abbey) Bragg died October 31, 1943, in Darlington Twp., Canada at age 91. Buried in Bowmanville Cemetery, Bowmanville, Durham Regional Municipality, Ontario, Canada. 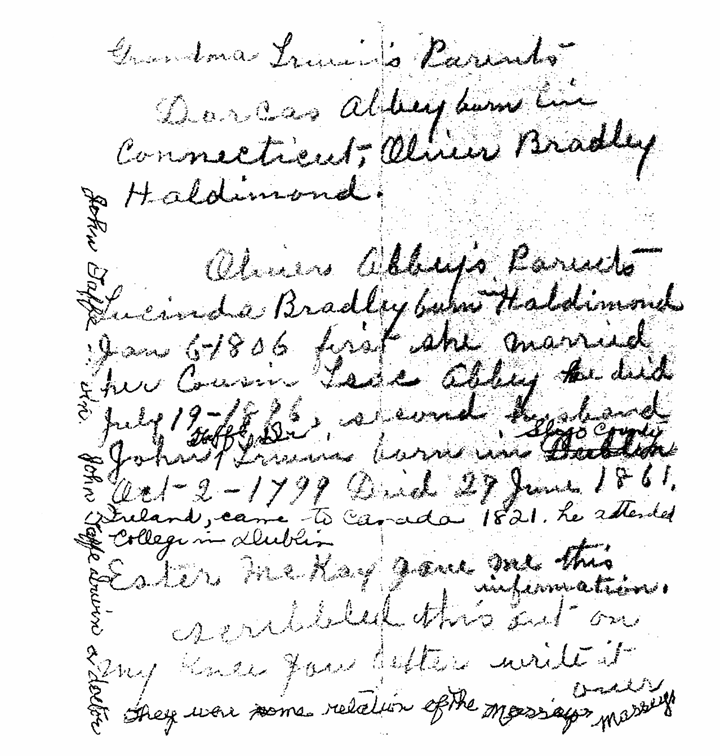 Ellen Jane (Abbey) Bragg Death Record. Another Newcastle lady, Mrs. S. S. Bragg, attained nonagenarin standing on Sept. 3rd, which was her 90th birthday. With her to celebrate the occasion were her daughters, Miss Rowena Bragg, who lives with her mother, and Mrs. E. C. Hoar, Newcastle, also her sister, Mrs. Armstrong, Toronto. Several friends called to extend their felicitations and Mrs. Bragg also received a number of congratulatory cards including one from the W. A. of Newcastle United Church. 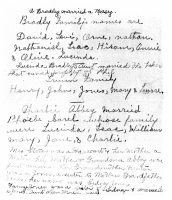 Birthday greetings were received too from Mrs. Bragg's son, Mr. Arthur Bragg, and his wife, the former Miss Marion Baskerville, and their two sons, Ranier, Alta. Large bouquets of gladioli and other flowers, tributes from local friends, adorned the house for the birthday occasion and the week following. Mrs. Bragg was the former Miss Ellen Abbey who was born at Charlecote in the neighborhood of Morrish church, east of Newtonville, and afterwards lived in Newcastle with her mother. She became the second wife of Samuel Smale Bragg of Providence, who died in 1925. After leaving the farm Mrs. Bragg and family bought a piece of land in Newcastle from Mrs. Jno. Douglas and built a nice, modernly equipped house on the property on Mill St. north, the first in that particular section of the village. Mrs. Ernest Haigh built a new house to the south and became next door neighbor. 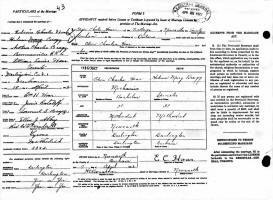 Joseph William Gordon and Martha Ann Bragg were married August 12, 1901, in Darlington, Ontario, Canada. 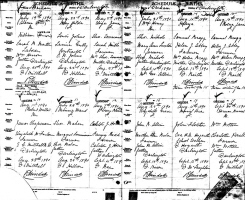 Joseph William Gordon and Martha Ann Bragg Marriage Record. 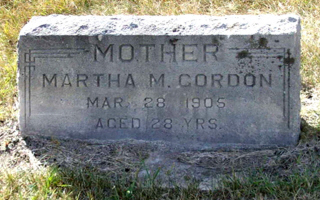 Martha Ann (Bragg) Gordon died March, 1905, in Manitoba, Canada, at age 28. Buried in Arden Cemetery, north of Arden, Lansdowne RM, Manitoba, Canada. Wesley Dobson Bragg died July 12, 1930, in Durham Co., Ontario, Canada, at age 56. Buried in Bowmanville Cemetery, Bowmanville, Durham Regional Municipality, Ontario, Canada. An esteemed and honored member of the Shaw's community. which has of late lost so heavily of its man power, passed away early Saturday morning, July 12th, in the person of Wesley Dobson Bragg, elder son of the late Samuel Bragg of Providence. He had been in poor health for some time and for over eleven months had been confined to his bed, attended by his devoted wife, formerly Miss Edna Rickard, assisted by his daughters, Misses Beatrice and Grace, when at home from their school duties. The late Mr. Bragg’s first wife was Miss Amelia Osborne who predeceased him a little more than three years ago. 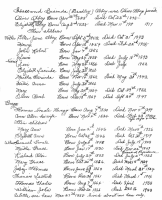 To them were born three daughters, Mrs. Howard Allin, Newcastle, and Misses Beatrice and Grace Bragg. Mr. Bragg farmed for a while on the home farm, Providence, and then moved on the Bellwood farm which he purchased from Mr. Wm. Jackson. He was very successful and when he finally sold the farm he purchased and moved into the brick house adjoining the estate of his uncle, Mr. T. C. Bragg, Shaw’s. Here his energy and industry found scope in caring for the few acres of orchard and small fruits which he cultivated and cared for with the most modern and scientific methods, and in modernizing the house and outbuildings. As a result of his ideals and his labours to bring then to realization there are few more productive places to be found anywhere or few better equipped country homes. But the making of a good home for himself and those dependent upon him was only secondary to his zeal for the Kingdom of God and his life long principles of putting first things first. In early life he identified himself with the Church, first at Providence and then at Newcastle and there never was a time as long as health permitted when Wesley Bragg could not be counted on to do his stare and generally more. He delighted to serve his Master whether in the management of the affairs of the church, teaching in Sunday School or singing in the choir. At the time of his death he was a member of the Committee of Stewards and therefore of the Official Board of the United Church, Newcastle, and until he asked to be relieved through illness was Chairman of the Committee of Stewards. His pastor, Rev. W. P. Rogers, conducted the service at the house, assisted by Rev. Roy H. Rickard, Oakwood, cousin of Mrs. Bragg, who offered prayer and sang “Does Jesus Care?”. A great concourse of friends and relatives from the immediate neighborhood and from many points beyond were present to show their sympathy for the bereaved widow and family and their regards for the deceased. Besides the members of the family already mentioned, the late Mr. Bragg is survived by one full sister, Mrs. Jos. Gordon of Manitoba; his step-mother, Mrs. S. S. Bragg; his brother, Arthur, and two sisters, Mrs. E. C. Hoar and Miss Rowena Bragg, all of Newcastle. Joseph William Gordon died June 13, 1954, in Winnipeg, Manitoba, Canada, at age 85. Buried in Chapel Lawn Memorial Gardens, Also known as: Assiniboine Memorial Park Cemetery, Winnipeg, Greater Winnipeg, Manitoba, Canada. Joseph William Gordon, 85, of 288 Niagara street, died Sunday in his home. Mr. Gordon was born in Tweed, Ont., and came west in 1892. He served as Methodist lay preacher in Wawanesa, Man., district for a time. He attended Brandon, Man., Normal school and taught at Arden and Souris, Man. He was appointed to school inspectoral staff of the Manitoba department of education in 1910. He was posted for a time at Morden, Man. and later at Manitou where he was appointed as principal of Manitou Normal school. In 1931 he was transferred to Winnipeg and did inspectoral work in the Kildonan area. He retired in 1938. He was past master and life member of Manitou lodge No. 30 of the Masonic order, the School Masters club, the Mentor's club and was for many years active in the Manitoba Educational association. Surviving are his wife Bernie and three daughters Ethel, Mr. S. N. McElheran and Mrs. G. E. Weightman. Funeral service will be held at 4 p.m. Tuesday in the A. B. Gardiner funeral home, Dr. W. E. Donnelly officiating. Burial will be in Chapel Lawn memorial gardens. Birthday greetings to Philip Cunningham, Michael Pearce, Sharon Head, Kelly Powell and to Miss Rowena Bragg who will be 99 years young on August 10. Miss Bragg is a resident of Marnwood House, Nursing Home, Bowmanville. He served in WW1 #1262246, enlisting on April 12, 1916 in Toronto. He served in France with the CDSC, as a Private. He was discharged on July 12, 1919 in Toronto, as he served with the army of occupation. They lived in Newcastle. He was known as "E. C." and was quite active in Community affairs. Edwin was a mechanic, and operated the "Newcastle Garage"